Nashville, TN. (February 5, 2015) — Curate Health announced that David W. Johnson, Founder & CEO of 4sight Health, was elected to Curate’s board of directors. Dave launched 4sight Health after a distinguished investment banking career. 4sight Health is a boutique healthcare advisory and venture investing firm. Dave is a prolific writer and speaker on topics related to healthcare policy, reform, strategy and capital formation. He is currently authoring Market versus Medicine: America’s Battle for Better Healthcare at Lower Prices, which will publish later this year. 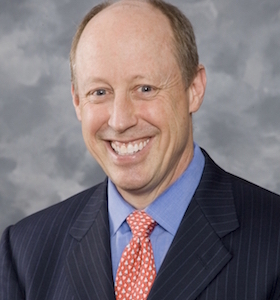 Prior to founding 4Sight Health, David served large health system provider organizations and enterprise non-profits as an investment banker with bulge-bracket firms, including Citigroup, Merrill Lynch and, most recently, BMO Capital Markets, where he managed the firms Healthcare and Higher Education practice. Over a 28 year career, David lead-managed over $30 billion in healthcare revenue bonds, led strategic advisory engagements and advanced capital formation, asset-liability management, enterprise risk analytics and new business model development for his large health system clients. Additionally, Dave serves or has served on the Board of the Chicago Council on Global Affairs, the Audit Committee for CHRISTUS Health and Visiting Committees for Harvard Medical School and UChicago Harris School of Public Policy. David is a graduate of Colgate University and Harvard University with a Master’s in Public Policy. Curate Health, LLC is a privately-owned, limited liability corporation based in Brentwood, Tennessee founded by Paul Clark and Hal Andrews. Curate Health serves patients and families with a personalized mobile application for smartphones — automating, amplifying and augmenting the patient experience with real-time information, education and empowerment. Curate Health serves healthcare providers as the first real-time, consumer-friendly mobile patient experience platform backed by actionable, patient-specific analytics to improve clinical quality and patient experience. Founded in 2012, the Company innovated the first mobile application for patient satisfaction measurement. Today, Curate Health works with several leading health systems and a major academic medical center. Learn more at www.curatehealth.me.